Whether you are studying at an art school, an atelier or teaching yourself there is such an enormous amount of solid work worthy of study out there. I suggest in addition to the following short list of books, and there are many more, that you get into some intensive study of the works of your favourite artists. Museum visits will give you a more accurate representation and more rich understanding of their work and how they created them. Chase after what inspires you. Experiment. Study, study, study. Talk with other artists that share a similar interest, share what you know or are studying. Here’s a brief list of some books that I think are both useful, well put together and offer a comprehensive look at the world of art making. I have also added a couple of books on drawing because I believe the foundation for all good painting is good drawing. Be thorough with your studies. If I gave you a giant list I may rob you of the joy of discovery so have fun with these and search out more. There is a huge resurgence in painting realism and classical atelier styled schools going on now and has been for the last few years. For me this is wonderful to see after growing up not really seeing any of it outside of history books. Everything was abstract or non-representational or at least very strange and far from anything I wanted to do. That’s fine if that’s what you are into. That is of course your choice. However, for those of you who eagerly search to learn the ways of the old masters you have a lot of options these days. Remember also that these new old schools are businesses. Find the right one that works best for you. Personally, if I was in a position to be entering an atelier style school my first choice would most likely be Michael John Angel’s school in Florence, (http://www.angelartschool.com/mja.html) but there are others worthy of consideration also. For those of you who are mostly self-taught, like me, building friendships with other like-minded artists, taking workshops and study through experiments and working from life can be extraordinarily fruitful. Whatever suits your way. As much as I think these atelier styled schools are awesome I can’t state enough the value I’ve developed for directing my own study. Whatever course you take, don’t waste time, study hard, be thorough, and do more than is expected. Be extra-ordinary. Your dedication will reward you. Here are some things I would like to leave you with, for you to keep in mind as you move forward. Learn to balance treating your work as both as a skill you are developing and something you are expressing. Balance the technical with the expressive. Care for your materials and your tools and maintain a safe and clean environment. The better you know your tools and how to use them the better you will be able to express your ideas. Paint from life as much as possible. 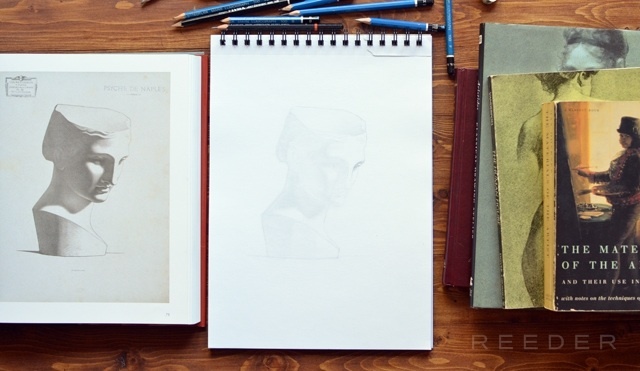 Study your favourite artists and artworks. Try to understand how they did what they did. Find a mentor, take a workshop, and/or enroll in a school teaching in a way that suits your needs and objectives. Keep a journal or write notes on your experiments. Never ever ever pour turps, oils or varnishes down the drain! They are all poison in that regard. Consider this when you work, you may want to use rubber gloves, as many artists do these days, especially when cleaning. Keep your studio or space well ventilated. Keep food and such away from your work space. Find others of like mind and be part of a larger community. Part of the joy in art is sharing. Don’t hide your work. To complete the circle it needs to be seen. Have courage. We all start somewhere. Have fun! I have known few joys greater than creating art. As serious as it can get art is about sharing the joy of life and making a small statement of our experience here. This series of posts at first became quite longer than I anticipated, however, I hope that some of you found something useful here. Please share this post with anyone who you think could benefit from it. Thanks for reading! If you have any questions please don’t hesitate to contact me. Happy painting! If you liked this post, click the heart and show me some love!